Speaking Volumes: "The Babu’s style is clear and good"
The Revolt of 1857 broke out on “a stiflingly hot Sunday” in May, as Christopher Hibbert writes. Summer was Mutiny season, and the British papers of the day mentioned both the unbearable heat and the unexpected betrayal. 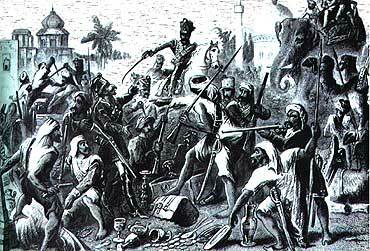 The more seasoned British Indian papers were less surprised by either the weather or the fact of the Revolt itself. As historians of 1857 have chronicled, the warning signs were everywhere. Two tracts, in particular, would become part of the larger history of Indian writing in English—Kylas Chunder Dutt’s A Journal of Forty Eight Hours on the Year 1945 (published in 1835), and Shoshee Chunder Dutt’s The Republic of Orissa (published in 1845). The Dutts were a fashionably literary family; Shoshee and his brothers were collectively dubbed the “Rambagan nest of singing birds”. Kylas was a cousin; the young poet Toru Dutt was also related to Shoshee Chunder; and Shoshee’s nephew, Romesh Chunder Dutt, was a well-known economic historian, whose first publication in 1877 was a history of the literature of Bengal. Shoshee and Kylas were Macaulay’s children, from Shoshee’s glad embrace of Christianity to their mutual belief (not shared by Romesh) that English was far superior to their native Bengali. Indeed, Macaulay’s infamous Minute (“we have to educate a people who cannot at present be educated in their mother-tongue”) came out in 1835, the same year that Kylas Chunder Dutt’s work of speculative fiction was published. “The languages of western Europe civilised Russia. I cannot doubt that they will do for the Hindoo what they have done for the Tartar,” Macaulay observed. And yet, the first serious work of fiction, speculative or otherwise, in English by an Indian writer was Kylas’s destabilizing vision of an India in 1945, rising up against the “subaltern oppression” of British rule, where “the dagger and the bowl were dealt out with a merciless hand” by the “British barbarians”. His projected rebellion fails; but the man who leads the Indians against Governor Lord Fell Butcher is a graduate fluent in English, using his education against the British. In the light of the way in which the Revolt of 1857 garnered public support in India just 22 years after Kylas penned his fantasy, it’s interesting that he imagines a rebellion supported by “many of the most distinguished men—Babus, Rajas and Nababs”. And he is prescient when he writes that the “contagion of Rebellion would probably have infested every city in the kingdom, had it only had time to perfect its machinations”. Ten years later, Shoshee could imagine a happier ending for those who would rise up in revolt. “The Republic of Orissa” is written as a page from the imagined annals of the 20th century, an alternate history imagined as the truth. Orissa is independent, and extending its borders into British India, ruled by “untamed men”, tribes who combine great strength with intrepid courage. In Shoshee Chunder Dutt’s reworking of the Noble Savage theme, the tribes rise up against the British after a Slavery Act is passed in 1916. They are goaded into final action by the imprisonment of publishers, printers and the suppression of a free press. (Present-day governments might want to take note of Dutt’s assumption that the curbing of free expression would bring on rebellion faster than a Slavery Act, in his vision of India.) As the fierce and courageous Bheekoo Barik confronts “drunken John Bull”, the question the tribals aim to answer is crucial: Are the Juggomohuns and Gocooldosses, the Opertees and Bindabun Sirdars fit persons to be intrusted with the management of a vast empire? Shoshee’s answer is a stirring yes, and the rest of The Republic of Orissa introduces a full-scale tribal rebellion, aided by beautiful women disguised as fakirs and other little flourishes of the novelist’s art. “The Baboo’s style is clear and good,” said The Englishman. “It will be a grand thing indeed for India when all her most influential families can be as much Anglicised as this Hindu gentleman,” wrote the Calcutta Literary Gazette. They were responding, however, to Shoshee Chunder Dutt’s poetry, and his articles on Hindu caste and practices—not to this vision of triumphant native rebellion that ends with the overthrow of the British. In many ways, Shoshee was exactly the kind of Baboo Macaulay had imagined—in a rant that praised the superiority of English over Bengali literature, he also refers to the native press as “servile, low and indecent”. But as time went by, his writings made the British who had praised him for being such a good Baboo more and more uncomfortable, whether it was his diary of a Keranee (published in Mookerjee’s Magazine), or this subtly subversive early work. The natives had taken to English, as Macaulay had hoped, but they were restless. As the first two works of speculative fiction in Indian writing in English prove, what they had to say in that tongue was not just prescient, anticipating the events of 1857, but also unabashedly subversive.